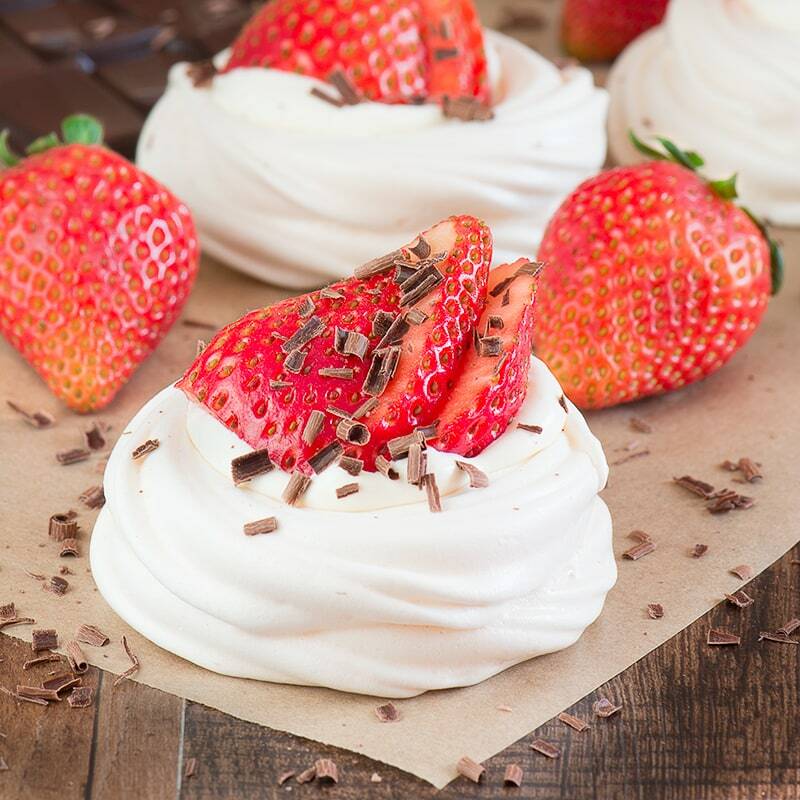 Mini strawberry pavlovas make a beautiful dessert and are quick and easy to make. Even better… they’re less that 140 calories each. 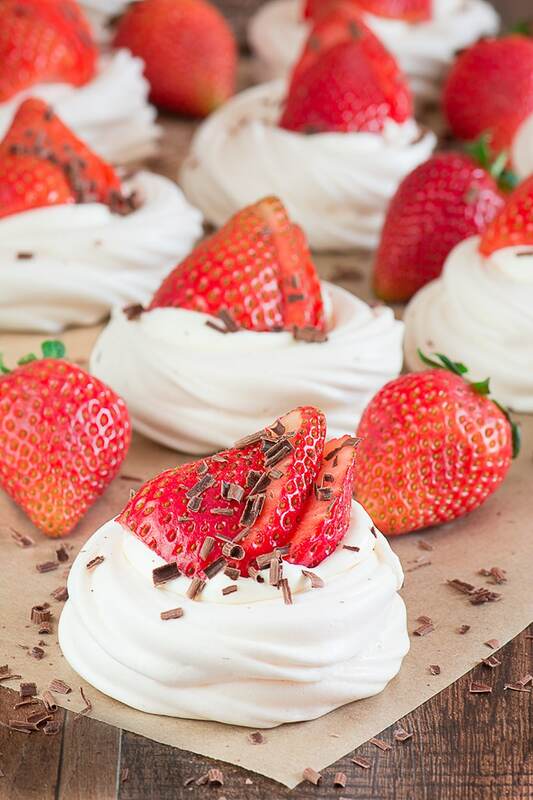 Last weekend I shared my tutorial for making perfect little meringue nests and today I’m going to show you how to turn them into gorgeous little strawberry pavlovas. I made these for my local parent and toddler group a few weeks ago and they went down very well (well all except one person who thought there should be a lot more chocolate on top!). There’s a few parents there who cannot eat gluten and it was so nice to be able to make something that everyone could enjoy (as these are naturally gluten-free). I really need to work on some gluten-free cakes to take along too. 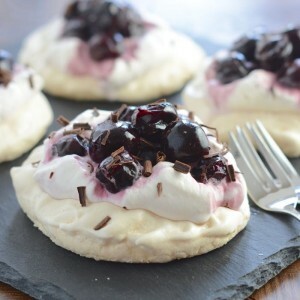 Another great thing about these pavlovas is that in comparison to the yummy cakes I normally eat at the group, they’re much lower in calories (less than 140 calories per pavlova). I had one of those moments where I calculated the nutritional information and then rechecked it 10 times because it was so much lower than I was expecting. I made them exactly the size I wanted them and didn’t make any “healthy” substitutions, they’re still full of sugar and cream. I’m not going to pretend they’re healthy, but if you’re dieting but craving something naughty, these are a nice way to be indulgent without breaking your diet too badly (just go for a walk for half an hour and you’ll be back where you started again 🙂 ). 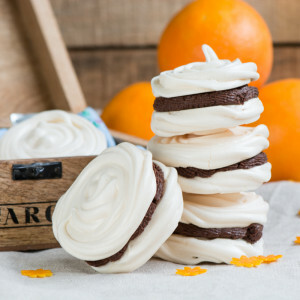 To ensure that your pavlovas don’t go soft and soggy I recommend making them as close to eating as possible, they’ll still taste good if left for longer (I’ve kept mine in the fridge and happily enjoyed it the next day) but it will lose it’s crispness as the cream soaks into the meringue. Start by whipping your cream, I use an electric mixer but if you’ve got strong enough arm muscles you can do it by hand. If you’re using an electric mixer check it regularly to ensure that you don’t over-whip it (take a look at my tip at the bottom if you do!). You want it to be soft and smooth but firm enough to hold it’s shape if you remove the beaters (although in a slightly sloppy way rather than really firm). While the cream is whipping, remove the green bits from your strawberries and chop then into slices. 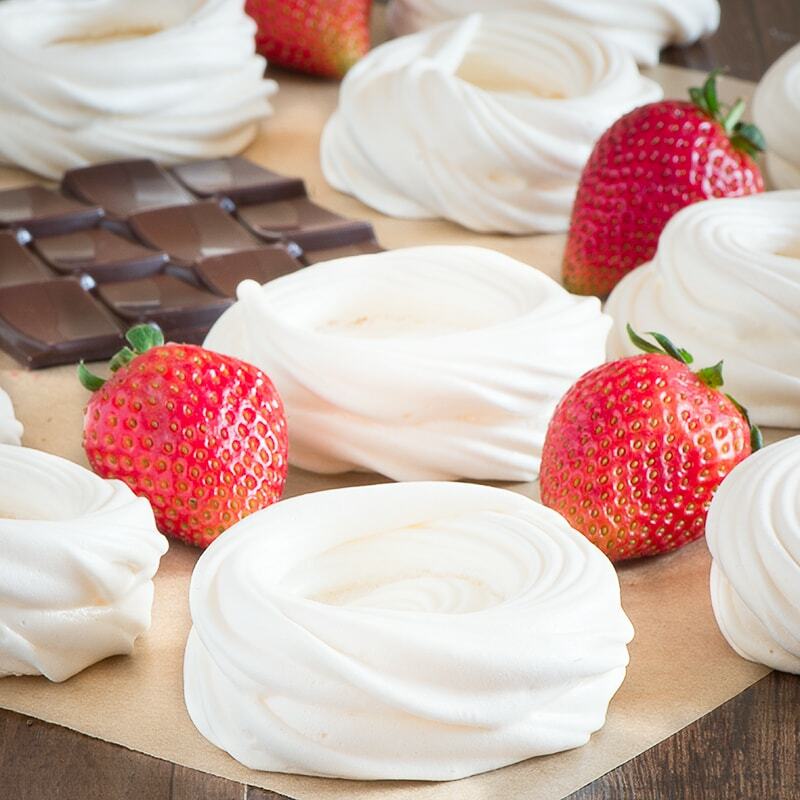 Spoon the cream into the meringue nests and top each one with strawberry slices. If strawberries are out of season you may find they’re a little sharp. If this is the case sprinkle a pinch of caster sugar over each one to add a little extra sweetness. Use a peeler to shave a little dark chocolate on top of each one and serve (they also look really pretty garnished with some mint leaves if you have any). It’s really easy to look away from cream while it’s whipping just for a moment and then turn around and discover it’s gone too stiff and grainy. If this happens, don’t panic, simply add in a teaspoon or two of milk (even skimmed works) and fold it into the cream. You should find that softens it up perfectly. This is the estimated nutritional information per mini pavlova. Please refer to my guide to Charlotte’s Lively Kitchen nutritional information if you want to learn more about how this is calculated. Wow! Wow! Wow! I’ve made many pavlovas in my life but this little recipe – and your tips – are fantastic. I own a cafe and wanted to make some individual pavs for a catering order. They turned out perfectly – probably the first time ever that there were no cracks. I had a few left over and stored them in an airtight container for about 5 days – they were still perfect! (My husband and I ate then for desert 🙂 ) I am making them again today to sell in the cafe and will use up the yolks to make a lemon curd filling to go with the strawberries. Thanks Charlotte!! Ahhh…. 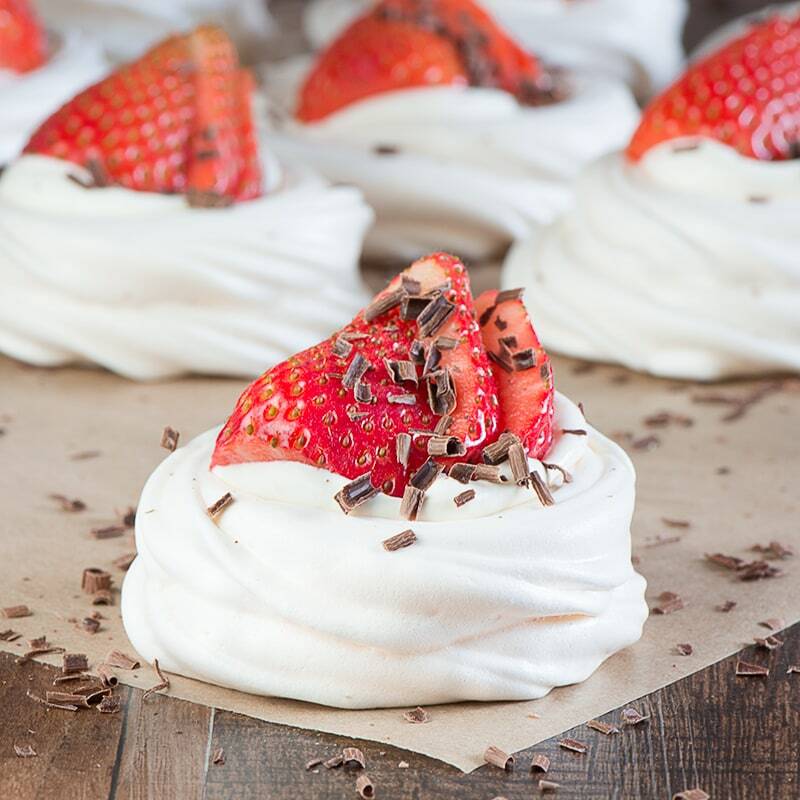 You can’t beat a good pavlova and mini ones seem so much more sophisticated…… Trouble is, I can’t resist them….. Not sure I could even stop at three! I have seen your beautiful creation at foodgawker. 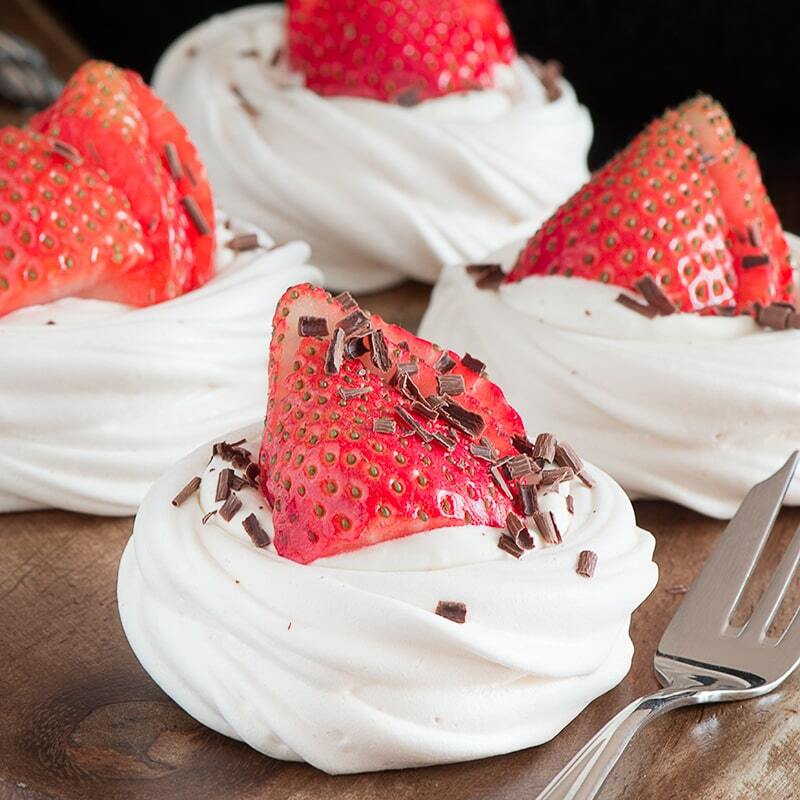 You have some wonderful recipes over your blog and the Mini Strawberry Pavlova looks drooling. Oooo yes I do love a good pav! Not eating them any more though. Hey ho…life’s too short to get upset about it! I feel so much better ‘sugar-less’!! Show-off!! So proud of how well you’ve done. I still can’t seem to tempt myself away from meringues and homemade truffles. They do, even if you have 2 it’s still lower in calories than a slice of cake! Glad you’re not going too crazy. I tried making meringues using coconut sugar and they didn’t work too well. Far too sticky – I could barely chew them. I’ve heard good things about using aquafaba let me know how it goes. I actually laughed when I read you were freezing them. You’re so funny, Charlotte! I have absolutely no willpower when it comes to meringue. I made too many and put some in the freezer, they were gone in a couple of days as I fancied a few snacks! I assume you’re going to use aquafaba, anything else weird and wonderful?